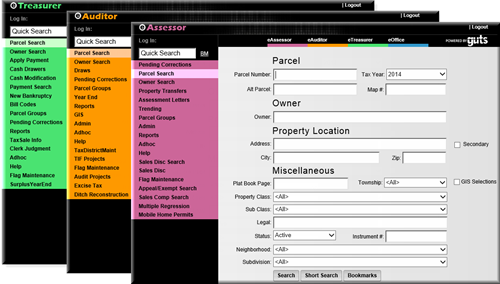 The PVDNET® suite of products (eAssessor, eAuditor, eTreasurer, and eOffice) is specifically designed for CAMA and Tax & Billing professionals and has incorporated these respective functions in one integrated property tax system. Business rules have been incorporated that will enable elected officials to comply with State Statutes in all facets of their property-tax-related duties. This truly integrated system eliminates the possibility of redundant data resulting from entering data into multiple databases. PVDNET® enables CAMA and Tax & Billing professionals to share the same data and to view the data not traditionally available to other offices. Roles have been established in the security structure to allow users either read-only access, partial modification of some records, or full edit capabilities. PVDNET®’s web-based functionality and security roles make it easy for elected officials to allow individuals and businesses to have read-only access to public data. PVDNET® also accommodates the use of the Internet when the public wants to do business with counties for e-commerce transactions. Elected officials are constantly being asked to do more with less. Enhanced use of technology can assist officials in streamlining business processes to improve quality and reduce the effort required to perform their duties. GUTS has created functionality in PVDNET® that absorbs most of the desktop work currently performed by offline users. The database structure was developed to be readily adaptable for legislative changes and will support the business process changes necessitated by state statutes. PVDNET® utilizes wireless technology for assessing officials who want remote, real-time access to property system data while doing their field work. It will be possible to create sketches in the field and access GIS data from anywhere in the county. PVDNET® will accommodate the sharing of property data with the commonwealth, state and other units of government. Commonwealth, state and county officials can send or receive sales data, tax rates, and abstracts electronically. PVDNET® will also be able to integrate with other systems with which the county needs to share data (i.e. GIS, Permits, Realtor Sales, etc.). Sharing data will increase the speed of processing data and it will eliminate the potential for mistakes that cost the county time and/or money. GUTS is partnering with several companies to provide enhanced integrated services with PVDNET®. These integrations include, but are not limited to: cashiering, remote data capture, remittance processing, document imaging, sketches, wireless technology, and GIS. GUTS is fully aware of the many challenges that face a county when contemplating a significant move to a new property management system. A few of those challenges include: converting massive amounts of data from the legacy property tax system and from many ancillary systems; training employees to learn new systems; making programmatic changes to comply with current local requirements; and the need to implement a fully automated tax and billing system. GUTS stands ready to work hand-in-hand with county officials to find solutions for these challenges – and more. The GUTS team is accustomed to working with the end users to facilitate change and improve business processes by utilizing the latest and greatest technology. The team includes several MBE/WBE partners who have a great record of working on state and local IT projects. PVDNET® can offer your county numerous advantages as you strive to provide a high level of service to your taxpayers. For more information about PVDNET® or to Schedule A Demo, contact us TODAY!